Real hardwood floors are a beautiful feature to have in your home. They bring a unique beauty to your home that is different from other flooring options. As wood floors age homeowners often find themselves wondering if they should replace their hardwood floors or refinish them. Today Mike’s Custom Flooring will go through both options so that you can make an informed decision. Professional Hardwood Floor Refinishing Cost: If you search online whether you should replace or refinish your hardwood floors you will find that across the board people say that it is definitely cheaper to refinish. Hardwood flooring can be sanded down and refinished up to seven times if it is properly done and properly maintained afterwards. 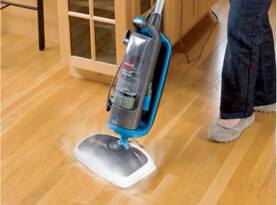 It is estimated that it costs five times as much to replace your floor than it does to refinish it. How Long Does it Take to Refinish Hardwood Floors: Refinishing your floors does take a considerable amount of time more than replacing them. You have to remove all of the furniture, sand it bare, make any necessary repairs, and stain it. If you are doing the work yourself typically it will take longer because you are not as familiar with the process and you are trying to fit the job in between your regular job and your family. 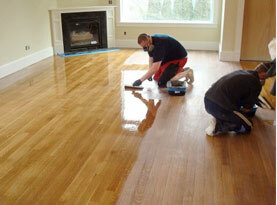 Many homeowners choose to hire the refinishing process out. 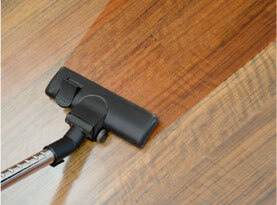 Leading Carpet Cleaning does refinish hardwood floors at a competitive rate. Hardwood Floor Refinishing Options: There are many different paint and stain choices on the market now for hardwood floors. If you do not like the look of your current hardwood you can get a new look without having to replace it by simply choosing a paint or stain color that you like more. Age of Hardwood Floors: If your hardwood floor has been refinished too many times it may be time to replace your flooring. If you can see the area called the tongue where the boards fit together it is probably time for new floors. You will also want to replace if you can see the nails on the flooring. 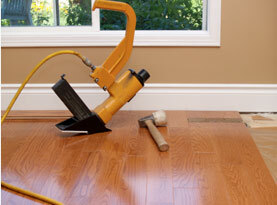 Hardwood Floor Damage: Over time your flooring may have become too damaged to refinish. If more than 30% of the boards are warped, chipped, stained beyond repair, or been damaged by termites it is probably time to replace them. Sometimes there is structural damage that has occurred that makes replacing your hardwood floors the better option as well. Hardwood Floor Aesthetics: Most homeowners that choose to replace their floors instead of refinish them are just ready for a new look in their home. As stated above you can paint or stain your existing hardwood floors to create a new look that you like more but there are some things that you can’t change without replacing the flooring. If you don’t like the width or length of your flooring you will need to replace it. If you do not like the species of wood that your hardwood floor is made out of you will need to replace it. If you want the flooring installed in a different direction you will need to replace it. We hope that this information has helped you decide whether you want to replace or refinish your hardwood floors. No matter what you decide Mike’s Custom Flooring can help you. We offer refinishing and installation services at competitive prices. Give us a call today!